Emi's random word generator and foodie blog. By Emiliano Silva Lee on June 15, 2013 10:51 PM | Say Cheese! Shaken to the core. Split, even. Raw, vulnerable, lost. There's no way to vocalize how I truly felt upon my father's passing last September. To this day, that deep pit of loss in my heart wells dark from time to time, sucking me right back to those moments; and I imagine it always will. I have to remember, cherish, and embrace all of those memories of times, words, and space shared between Louie and I... and acknowledge that no matter how deep the pit, his love will always be greater as only the unconditional bond of blood and spirit, of father and son, ever in silence and solitude shall be. I think from time to time that the silence is now unending, but it's not. The silence is full of everything that ever was, can, and will be. There's a fine line between being enveloped by and embracing it... and for quite some time, I was more on the the side of the former than the latter. So here I sit as my facebook friends and family change profile pictures to their pops, and I waver between crying and laughing. My father was many things to many people, and despite his many flaws, he was at his core a good man. Whether railing against the racial and social injustices he faced in his youth... running with the Red Guard, the Panthers, I Wor Kuen... Whether teaching the first ethnic studies course in the Cal State system as a grad student himself (where he ended up after getting kicked out of Berkeley for clocking a professor who called him a no good Chink)... Whether opening an Asian American legal center in downtown Oakland... Whether bringing breakfast and coffee to rally his brothers on the picket lines at Alpha Beta... Whether turning his home into a halfway house for recovering addicts... Whether driving into the desert to lend an ear and counsel to troubled Pasqua Yaqui, Navaho, and other tribes... I'll leave the "or" unspoken. Growing up, he was my hero. He could never do wrong. As an adult, I came to know the man behind the mythos and saw he was just as fucked up as the rest of us. That was sobering at first and I honestly didn't know how to deal with it. Eventually, acknowledging it allowed us to speak openly of what he perceived as his failures, and for a time I became the one hearing confession and offering solace. In the end, we were equals, and each as proud of the life and understanding of the flaws of the other. We seldom spoke. We never really felt the need to. From time to time, he would call; and on rarer occasions, I would... and in those initial awkward silences we were reminded that it didn't matter. He was there and I was here and we would always be. The unspoken bond of love that the men of the house of Lee seem to share. That was a bomb. For a time, I was lost in the "what ifs..." and "if onlys..." but you just can't live like that. I won't. It's been nine months since Louie died, and this is the first time I've written about it. I won't rehash the events... won't go into the dark details of my despair... won't rail against everything and everyone I could blame for keeping us apart when he was alive. But I will do everything I can to honor him always with my own life, to be that hero I grew up believing him to be. The room disappeared, and my brother and I were standing on the shores of a cold grey river. My father lay just as cold and still atop a funeral pyre, and I lit fire to the wood with torch in hand... the flames from the burning pitch singing the hair on my arms. As my father's final resting bed caught fire, my brother and I stood shoulder to shoulder in silence watching the flames embrace the body of the man who brought us into this world. Watched as they grew red and hot, turning his body to embers, the physical vessel disappearing and turning to ash born upon the wind and water, returning to the earth. In that moment, I felt we honored him with our own lives and legacies, felt his life honored in it's passing, felt proud and pride, and smiled through the streaming tears and chest heaving sobs as Apollonio and I embraced each other perhaps for the first time since we were children. When we stepped outside into the parking lot, my brother looked at me to reassure me and said that wasn't Louie... that was just a body. I looked at him and looked around and saw the mountains surrounding Tucson, the cacti on their distant slopes, the changing colors of the dusk sky, wispy fingers of cloud stretching across the grand vista and said, "You're right. That isn't Louie... this is." By Emiliano Silva Lee on July 3, 2012 3:29 PM | Say Cheese! I have been blessed with a number of great guides in this world of cheese that I have been navigating the last several years of my life. Most of them are women, and among them Daphne Zepos was one of the greatest. For a while, she was "just" a brilliant smiling face I would see across the room at conferences and trade shows. Then, one year we were introduced and instantly she took me under her wing, "Ah, Mister Emi, I've heard about you..." she said. Mister Emi. The lilt of those words as she would smile a half smirk, half wink, as if she had me all figured out when even I was still finding my way. And over the years, that would be how she would call me and how I will always hear her voice in my head. Though our meetings were seldom and our conversations all the more infrequent, there was always a familiarity and understanding with which she spoke to me. It honored and humbled me to know this woman had taken interest in my career and was keeping tabs on me. "So, Mister Emi, tell me about..." she would often start our conversations with. Whether it was my ideas about distribution, farmers markets, or that dreaded A word "affinage" she would always pick my brain to see what I was thinking about and talk about what was on my mind whether immediate or just shelved for long term development. She always wanted to help steer my course, but never in any sort of invasive way. It was a comforting guidance that always led me to my own decisions, simply shedding light on my paths or offering me others I hadn't yet seen. Most recently, she was key in my decisions to leave Utah and return home to California. Her and so many others, but there were key moments that I have come to associate with her. Three in particular. I attended a conference in Sonoma, but I wasn't really there. I did my best to focus, but I was so worried about everything that had become my life in Utah. My work, my love life, my happiness... where was it all? I was distracted. I still managed to glean much and benefit from the conference, but there was something more I was in search of. I had hoped to catch up with a few people who had always offered me sage advice. Sheana certainly let me bend her ear, and there's probably no other single person I owe more to than her. But where was Daphne? Finally, on my last day there, as I sat on a panel of retailers, she appeared. Alas, we were leaving straight away after the forum... but her words for me then were so completely direct and poignant, her care for me apparent in their urgency. She grabbed me aside for just a moment and looked me straight in the eye. It was the only time she wasn't ever smiling when we spoke. She issued a warning that it was a small world and that people talk. She said that whatever I was to do, that I needed to do it right. And there was my decision. I was too invested in my position and had given too much of myself to simply walk away. I was going to give one last attempt at change with all my heart. And I did. Along with a committee of coworkers, we tried our damnedest, and all of us learned a great deal about ourselves, our camaraderie, and our potential in this world. Several months later, comes the third. We were in Montreal, and I hear a calling brightly behind me, "Mister Emi!" Daphne threw her arms around me beaming the most brilliant smile I had seen on her face, "Oh, Mister Emi..." and with her arm tightly around my shoulder, we simply walked slowly down the hall as she contemplated her words. We stopped and she looked at me straight in the eyes and once more was direct to the point, "I just have to say... congratulations. Wherever you go now, Mister Emi, you will be fine. Better than fine. You have a whole community behind you, and it has been a true pleasure to witness." And with those words, whatever darkness that lingered was washed away, and at that moment my decision was made. I was going to leave Utah and return home. Originally, I was just going to pack up and head back to the Bay Area... but that is a whole 'nother story. Regardless, where I am today I owe in great deal to the words and guidance Daphne has shown me over the years. I will forever cherish the moments we were able to spend together, mostly talking about cheese and the possibilities of cheese here in this country. She fostered many grand ideas, and her guidance and mentorship will never be forgotten by me nor so many others she has touched in our community. As Tia Keenan posted earlier today, "She was so much more than the Queen of Comte. She was the shepherdess of an entire generation..."
And that is how I will envision her, standing tall on some verdant green rolling hill, her hair and whatever beautiful scarf she wore for the day billowing in the breeze, her smile big and bright as she watches over us, her flock. By Emiliano Silva Lee on July 27, 2010 7:42 PM | Say Cheese! I met Marnie Clarke a couple years ago in a hotel room in Chicago. In Gordon and Sheana's room at the historic Hilton, site of the 1968 Democratic Convention and riots to be more specific. It was during the American Cheese Society's annual conference and I was busy having my mind blown by all the amazing, empassioned, artistic, kindred spirits I found myself surrounded by. This was home, and these people were soon to become like family. Marnie and I were the new kids, each of us sitting and standing quietly, taking it all in as the rockstars of the cheese world stumbled in for a drink with friends and fellows seen only as often as the circuitous routes of cheesemongering allow. Last year, the ACS conference was held in Austin, Texas. There, Marnie and I connected again and quickly became friends, along with her sister Lydia and mother Donna (who I really know more affectionately as "Goose")... over the course of the conference, we shared experiences galore and fast formed dear friendships and mutual admirations. It was in Austin that the Clarke sisters broke the news to me of their decision to start a business... to open their own cheese shop! Over the course of the last year, I've touched base often... though not as often as I'd like... and consulted with them in regards to nearly every aspect of running a cheese counter, and I did so openly and freely. They were pursuing a dream (and one that I share), and I wanted to do everything I could to help them succeed. When Lydia attended the NASFT Winter Fancy Foods Show in San Francisco, I made sure we met up and I introduced her around to several folks I thought she should know. With help from myself, Sheana, my boss Steven, and other friends and kindred business spirits, we made sure to give Lyds solid guidance and send her home with notes and connections to ensure success in getting them going in the right direction. From afar, I shared the pursuit of their dream vicariously, offering advice every time I was asked, sending messages of support and inquiry, and making myself as available as I could whilst remaining focused on the success of my own cheese counter. As opening day grew ever nearer, yet never really set in stone, I itched to be standing alongside Marnie, Lydia, and Goose. I wanted so much to be there, but my own schedule was becoming fuller by the day. Finally, Marnie messaged me and told me they had a date for the Cheese Cave's Grand Opening, Saturday July 24th... and was it possible for me to make it? It was barely weeks away, and I had coworkers out on vacation that week... I cautiously and reservedly told her that chances were very unlikely. Abuzz inside and determined, I sat down and looked at the schedule for that week and the next. A little pencilwork and a couple phone calls later, I called the Cheese Cave and said, "we're a go!" Last Friday, I worked from 8am to 6pm, came home, went to the airport, and flew to Ontario where Lydia picked up me and her boyfriend Reed (who landed from the Bay Area just ten minutes later). We picked up some beers, went to the shop, and worked late until around 3:30am setting fixtures, shelves, displays, and making sure things were in order for the following day's festivities. Saturday, we awoke, ate breakfast, hit the shop around 9:30 or 10, and went straight to work prepping for things to come. Guests showed up before the event to buy cheese, and even though the doors were closed, we let them in for service and gladly helped them find fabulous fromage. LA Magazine came and did a shoot and interviewed the girls. By noon we were ready, and the madness began once we openned the doors and rose quickly to crescendo! The event was scheduled to run until 4, but we kept the doors open until almost 6:30 because people kept pouring in. What teamwork and camaraderie! Each of us was a link in a chain that drove the party steadily onward... selling, cutting, wrapping, cleaning, schmoozing, laughing, crying (there were a few tears of joy shed), cringing, hugging, sighing, and in the end standing together, holding eachother up with arms and smiles and laughter enough to sustain almost the hungriest of hungers... though consensus was that we needed beers and burgers and we needed them fast! And so we closed the doors, but opened the book and stepped out into a story of success in the pursuit of a dream... This is only the beginning for the Clarke clan, and I am blessed to count myself amongst them. My heartfelt congratulations, thanks, adoration, and respect to the rest of the team: Marnie, Lydia, (Donna) Goose, Noah, Reed, Milan, Kristen, and Felix! Best of luck, my friends. Check out this wonderful video from Christine Hyatt, aka the Cheese Chick. Shot on location at The Wedge Festival in Portland, featuring Artisan and Farmstead cheesemakers of the Pacific Northwest. This message embodies what I try to support as a cheesemonger and promoter of sustainable agriculture. I think the average price per pound of cheese in my cases is probably somewhere around $21/lb, ranging anywhere from $12.99 to $39.99. It can cause sticker shock to the uninitiated, and it's hard sometimes to break people's price-based perception of the value of taste... but as you can see in this video, there's a tremendous amount of care, labor, and time that goes into bringing these beautiful cheeses to you... and likewise, a tremendous amount of care and labor on my part (and on the part of my staff) to ensure that you pick up a piece of cheese that these cheesemakers would be proud to see on your table. At $21/lb, you're not filling our coffers, you're supporting the time and labor intensive craft of artisan cheesemaking. If we were in it for the money, we wouldn't be in cheese! By Emiliano Silva Lee on November 22, 2009 4:00 PM | Say Cheese! This isn't an entry about food per se, but when it comes to my passion and the way that I live my life day to day, the things I do... this post is about a piece of who I am. Literally, like chromosomes and all that. And I suppose it really does have to do with food on some levels... and it starts today at work, which is of course all about food. This is perhaps the busiest week for those of us in the retail grocery and specialty food business. Today was my 14th day in a row at work with hours anywhere from 4 to 14 in a day, and I still have 6 more days until a scheduled day off. And yes, on some levels it's exhausting and my feet and back hate me, but it is very much equally if not more exhilarating and exciting and fulfilling. The customers, the interactions, the bonds formed as strangers entrust me with their menus and food choices that could make or break their dinners, dates, and more. Honestly, it's like a game. A puzzle. A riddle. A mathematical equation. A painting. A contest... a fine balance when it comes to all the orders I've placed leading up to this holiday season over the past couple months. Time to see if my planning pays off, if I made the right educated guesses, and also if my staff can keep up with me and help send every guest who walks into the store home with some beautiful new flavor they never knew they'd love. I went in to work early today, a couple hours before we opened, in order to make sure all my cases were stocked, that everything was in order and ready to go. I didn't want my staff to need to leave the cutting or sales floor for anything. Noon came around and Camden and Tomi were both on the cheese counter, so I decided to take a minute to eat lunch before cracking into a new wheel of Parm. I checked the time on my phone and saw I had a voicemail and missed a call. It was my dad. Now... my grandma has been ill or sick on and off for the last few years, and as time's passed I keep imagining my dad calling to tell me the bad news. I thought that again for a moment, then brushed it aside remembering when he called on my birthday a few weeks ago and said he'd try calling more often on my days off. Since today was technically my day off, I figured he was just touching base. I dialed my voicemail and there was my dad's cheery voice... alas, masking the bad news I've been fearing he'd call with. I stepped into the front door of the offices next door, and Alex and Josh were sitting at the table eating lunch... as soon as my dad's voice said "Harrison called to tell me..." I began to cuss under my breath and walked swiftly into the kitchen as words I never wanted to hear passed through the air... I leaned against the counter and took a deep breath, but instead of a calming exhale, I began to sob... and I cried, and Josh came in and put his arms around me and held me while I cried. Alex followed and I told them the news, and we hugged and I cried some more and then talked a little bit about her. Those are awkward moments, but I'm glad they were both there. I'm blessed to work with people like them and everyone else at the shop. We're pretty much family more than coworkers. One of the benefits of working for a small shop full of passionate, creative, and caring individuals. I didn't eat lunch, but stayed in the house a while longer to try and center myself enough so that I could leave on my own and drive home. I told Kathy the news when she came back inside and we talked for a spell as well... then I went back into the shop and got some more hugs, doled out some last instructions for the crew for the day, bought myself a marzipan stollen, and made my way home with Metallica's "Fade to Black" blasting fittingly over the speakers as I drove. I got home, walked in the door, opened my mouth to speak but only a muffled sob escaped... so I fell onto the bed and into Lia's arms and I cried harder than I have in several years... so hard I couldn't breathe, every muscle in my body conducting the sadness and loss I felt inside. My grandmother, Lulu Lee, was a beautiful woman. She had a light about her that shined and touched everyone she'd ever come in contact with. It emanated from her big glowing smile to the laughter that seemed to be wrapped about every word she spoke. There was simply a great joy in everything she did. That was the woman we all knew and loved and called grandma, ma, Mrs Hon, Lulu. I always loved visiting her when I was a child. Being around her made me happy... and the candy dish she kept in the living room helped a bit I'm sure. The butterscotch drops were my favorites... those and the White Rabbit candy she broke out for us now and then. She knew also how much I enjoyed good food and always loved to cook for us and feed us. We would play out back in the garden and pick fruit from the myriad trees... big juicy black plums, oranges, tangerines, persimmon, pomegranate... there was always a bounty growing in her backyard at her house in Stockton. And while we played in the back, oh the divine scents that would come wafting from the kitchen window! When people comment on my Chinese cooking (and cooking in general), it's my grandma they have to thank for that! I loved sitting in the kitchen and watching her prepare and cook food... all the meticulous steps, and never a one skipped... from washing every leaf of spinach in the sink to the painstaking way she folded her foil wrapped chicken... even the way she wrapped our sandwiches in wax paper when we'd go out fishing. Anyone who's seen me on the cheese counter wrapping pieces of cheese or folding slices of charcuterie in butcher paper can see my grandmother's touch emulated by my hands. And the flavors! There is absolutely nothing better in the world than my grandma's Chinese American home cooking. I can only wish to be able to do even the simple things as good as she could. You've never seen a more perfect pot of stove cooked rice. Tender and fluffy and able to carry every nuance of flavor from your bowl (we didn't use plates much except for breakfasts) to your mouth... and the best part? The crunchy "bottom rice" that was always a perfectly pale golden hue. Never a burn mark or uneven browned spot. Seriously... if that was her rice... I will always strive to be as good of a cook as she was. I only hope I can pass on the joys I found in her food with my own. My grandma, Julia Child, and my dad... those were my Holy Trinity when I was growing up (with several other key notables... i guess one could infer them to be saints or apostles, then. heh). So many memories. So much food! The last time I visited my grandma was too long ago, just over two years gone by now. I rented a car and drove my brother and my mom out to see her, and we visited then went out for our favorite Chinese: Emerald Restaurant. If any of you live in or find yourselves in Stockton, this is a must eat at place. We've been going there for decades, and they serve some of the best tasting authentic Chinese food I've ever eaten... and I've eaten a lot! When my grandma walked in the door, everyone recognized her and shouted smiling greetings our way. The owner came out and took her hand and began chatting away with her in Cantonese. This was a normal occurrence anytime my grandma would take us out on the town. She and my grandpa used to own a couple grocery stores decades and a lifetime ago, and there are many people in Stockton who will never forget the service they received there. They were always more than happy to help people out and go further than that extra mile. There was nothing but good karma stashed in their spiritual bank. We were seated at tables that I'm pretty sure are the very same as when I first remember eating there as a young child. The building is an old Union building with a second floor that has windows looking inside where the old bosses would sit or open the windows to speak to those gathered below. It's right by the freeway in a pretty sketchy neighborhood. We always parked right in front. It was the food that always brought us back. My grandmother ordered all of our old favorites and even some of hers that we hadn't really had before. Everything came perfectly cooked and in heaping amounts. The giant family sized bowls of wor wonton soup are always a treat for the senses... light yet rich golden broth swimming with fat meaty wonton, prawns, squid, lap xiang, bok choy, char siu, baby corn, and black mushrooms. And as always, we left with enough food for another meal. That was the last time I saw my grandma in person. Before the broken hips, the convalescent home, the painkillers, the alzheimers... before any of that. And while I unavoidably sit here and wish I would've called her more, gone to see her more often, etc... I'm glad in some ways to have that visit as my last physical memory of her. I'm going to miss my grandma... but I've missed her for some time. Alas, that seems to be the case with growing up and getting older. I know that she was proud of me, and I hope that I can honor her life and the efforts she made to give us ours by striving to be even a fraction as beautiful, honest, caring, compassionate, reliable, and loving a person as she was. By Emiliano Silva Lee on October 13, 2009 9:57 PM | Say Cheese! The date of my last entry here just about coincides with when I officially took over as Manager for the Cheese & Charcuterie department at Liberty Heights. Understandably, I have been busy, but that's an awful long time to go without talking about cheese, food, or drink... especially considering just how incredibly saturated my life has been with all of the above. My apologies... if there's anyone reading, but mostly to myself for not keeping the dust from gathering in this corner of the ether. There are far too many happenings for me not to be posting here regularly, and hopefully I shall remedy that. It's always exciting this time of year in the world of food... well, in my world anyway! Workwise, I'm bringing in a lot of fun stinkers and rich mountain cheeses. In fact, I'm co-teaching a class in just a couple weeks at work featuring some Fall wine & cheese pairings. I'll be sure to post about that. We'll be doing a fondue class/party in early to mid-November that should be a blast as well. Can't decide if I want to feature two or three recipes... thinking my take on a traditional Swiss for one... an all American Farmstead/Artisanal for two... and perhaps a Utahan fondue for the third (with a beer & whisky base... or an alternative "Mormon" recipe featuring local cider hmm...). Regardless, I just thought I'd spew a few words out into the wilderness to remind myself of this existence. With any luck (and gumption! ), the next won't be another 7 months away. 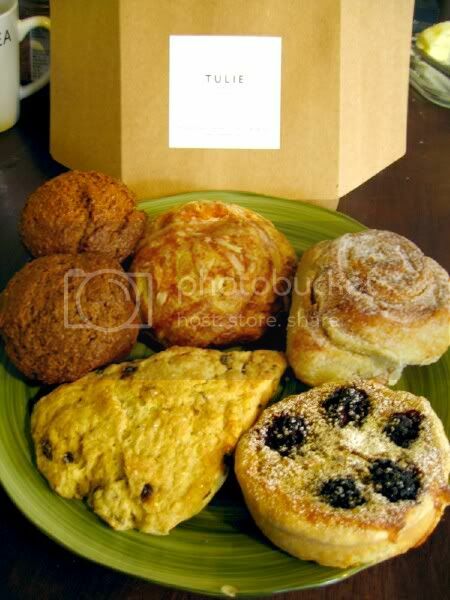 For a while now, I've been hearing all about Tulie Bakery here in SLC. My boss has even brought in some of their goodies on occasion, and every time I've been rather impressed. This last week though, he brought in a selection of pastries for breakfast for the morning crew, and what he gave me was a real taste of home. It looked like a scone, but wasn't quite. It was softer, more silky, melted in your mouth... but it was the flavors that got me. Back in San Francisco, my mom used to bring home scones (don't even get me started on what the locals call "scones" in these parts!) now and again... and my favorite was a savory scone flavored with cheese and fresh herbs. For years, I've been keeping my eyes out for something similar, but have been sorely disappointed and had decided the only way to capture that taste memory was to make them myself. Today, I learned that what Steven gave me last week was Tulie's "Gougeres"... as soon as I tore off my first bite, I could feel a shallow well of tears form behind my eyes. That was the taste. Spot on. That was what I had been hunting for all these years... and the texture was pure pleasure. The choux pastry was still warm and once the delicate flaky crust broke upon my teeth, the velvety dough simply melted into my mouth, filling my senses with a taste of home like no other. What I came to find out was there is another San Francisco connection. That is the owner spent a bit of time learning her craft at Tartine, one of my favorite hometown bakeries. Right on. Monday, I had the day off, but to my dismay I pulled up to Tulie only to find they are closed on Mondays. So, today Lia and I drove over after the dropped the kids at their schools, and I picked up a selection of various treats to try out. Of course, I had to have my Gougere! Lia loved it as much as I. In addition, we brought home (clockwise following the Gougere at the top pictured below) a Morning Bun, a Frangipane (almond with fresh berries) Tart, Scone with Currants, and Bran Muffins. The Morning Bun (an old Tartine fave) is like a cinnamon/sticky bun only it's made with croissant dough... this particular one from Tulie is rich, the caramelized bits almost like candy, not overly spiced, and has a bright almost lemony freshness to it in the background. The Tart had a wonderfully buttery crust. The edges were a little thick though, and I was afraid at first it might snap and fly everywhere, but it held up to the strength of my bite just fine. The contrasting soft custardy filling with almonds and sweet berries were quite fun. They also had a lemon creme tart and one with a variety of fresh berries. I kinda wish I'd gotten one of each! Though at just over $6 a piece, I just got one so that I could diversify elsewhere this trip. The scone was rich and moist, but not to the point of being gummy like some can be. Just a light sweetness from coarse sugar baked on top. Just right for a nice cup of Earl Grey. Though my coffee (still on the Blue Krishna from JMCC) did just fine. Last but not least, the Bran Muffins. I for one love bran muffins, so I always have to try them. Some judge bakeries on their croissants, some on their tarts, etc. I judge a bakery on its bran muffins. If they don't make any, I'm always disappointed... but they are an oft neglected item. The bran muffins at Tulie, like everything else so far, were just right. Nice crisp outer crust that broke crisp upon a gentle bite giving way to a soft yet substantial core that was moist and just barely sweet. A couple bites and a swish of my coffee to break it down, and I could feel the bran granular and yet silky. Definite thumbs up. I live not half a block from Panaderia Flores. I don't go there often enough. When I do though, I am overwhelmed by the smells and sights of memory. All those familiar cookies, rolls, buns, pastries, and cakes. Dusted with sugar, shining with egg wash, or frosted in that semi-sweet crumbly almost-dough goodness colored white, yellow, or pink. I always bring home armloads of these babies. Every bite takes me back to my childhood. That sometimes dry but never choking dough that crumbles into your mouth with each bite. Perfect for following with a sip of dark rich coffee (currently drinking Blue Krishna from Jack Mormon Coffee Company up in the Avenues). I am reminded of my visits to my grandmother. Mi abuela. My mother's mother. She lived in San Francisco's Mission District, and she would take me on walks and treat me to the culinary delights the Mission had to offer. Before Tartine. Before Ti Couz. Before any gourmet hipster coffee shops. Back when it was all Mexican working class, and on every block what would today be considered hidden treasures. Our favorite panaderia (and back then, they had a restaurant attached out back behind the bakery that had the best!!! chile rellenos ever... a taste memory that has yet to be equalled by that dish anywhere else in my adult life) was La Victoria down on 24th St. My grandmother and I would walk there and she would talk to me and tell me stories and describe everything I was seeing as we walked through her barrio. This was my culture she was teaching me, though I didn't really know it at the time. What I did know was that I loved taking those walks. They would culminate at La Victoria where she would proceed to pick through the cases filled with pastries to find just the right ones. Then she would let me pick one or two, and being a child I was always drawn to the most colorful. I would usually grab a big round bun decorated with swirls or tiles of bright pink and a cookie covered in (not sprinkles) pellets of brightly colored sugar that would crunch and pop in your mouth as you chewed. On the way back to her apartment, we would stop at this little hole in the wall restaurant. I wish I knew the name of the place, as I've never been able to find it again in all my visits to the Mission. It was dimly lit, practically a corridor... the cooks and food and menu board on one side, and a single row of tall tables on the other. Mexican blankets and calendars scattered across the walls... pictures of Aztec warriors with scantily clad maidens draped across their arms. It was here that I would get my ultimate treat: a steaming hot cup of vanilla or chocolate atole... thick and hot and just the right sweetness. Then we would go back to her apartment. Up that rickety old elevator. The dusty smell of old carpets in those cramped corridors and warm shadows in every nook. We would open her door and the sunlight would bathe us as we walked inside. Where was all this light coming from when everywhere else we seemed to go was so dark? We would sit at her little breakfast table in the kitchen and she would unload our wares and go to town. After eating our pastries, we would finish with grapefruit or mango from one of the grocers down the street. 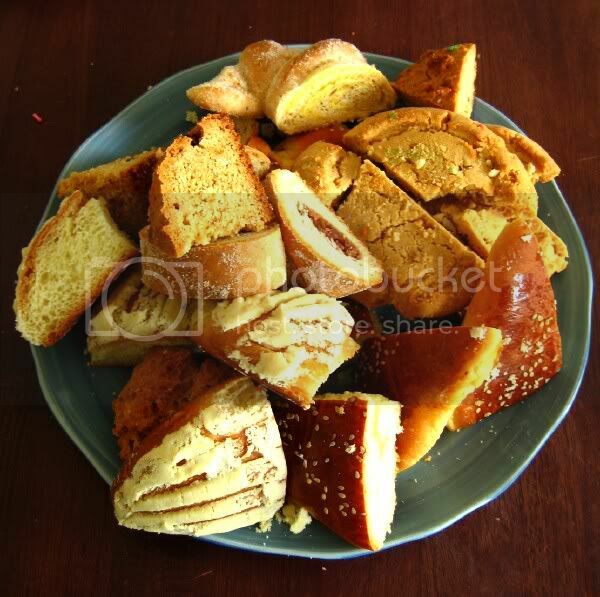 These memories flood my mind whenever I go to the panaderia, and I can feel my grandmother's smiling face upon me as I sit here typing, eating my pastries, drinking my coffee, and reflecting upon this gift she has given me. It is times like these that I really and truly miss her and appreciate all the experiences she openned me up to. I can only hope I am giving something similar to those two girls sitting in the living room playing on our Wii with a plate full of my memories sitting in front of them. The first time I ever brought them home, they expressed dissappointment. Where was the sugar and custard and filling and frosting? But as they began to realize, they didn't need any of that. All that sweetness would be lost upon the delicate flavors to be found in this world: almond, sesame, anise, even the wheaty dough itself. A heaven on earth for me in every bite where my grandmother resides and I am happy. "This is the best french toast I have *ever* had..." - actual quote from one of my coworkers! That and many other rave reviews spouted forth after Steven requested I cook up some breakfast for the crew. He and Tyler had come in early to reset the wall of pasta, and I was more than happy to comply. My first thought was to do a fritatta. Because I love fritattas, and they're easy, and you can throw just about any hodgepodge of ingredients in there and make it work. But just about every breakfast we've had at work has been some sort of egg dish, and I got the urge to do something different. 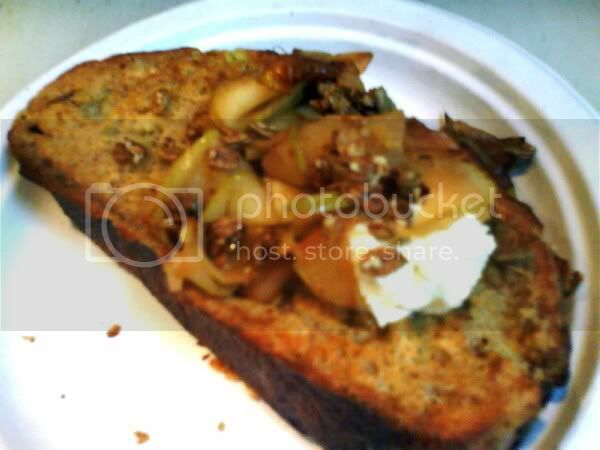 I cut up two loaves of day old Crumb Bros bread into nice fat slices (one country sourdough, one raisin walnut), put them in a hotel pan and drenched them with a mixture of milk, eggs, cinnamon, and sugar... meanwhile, I sliced up a couple granny smiths nice and thin, pulverised a thumb of fresh ginger, and tossed all that with some more sugar and cinnamon... I buttered up a baking sheet and put the sopping slices on it in the oven to bake while I caramelized the apples in a frying pan... zested some lemon into there as well, then finished the apples off with some of the juice. Before serving, I whipped up the mascarpone with some sugar and lemon juice... et voila! By Emiliano Silva Lee on March 11, 2009 4:32 PM | Say Cheese! Last night, author and NY Times columnist Thomas Friedman was in town on a book tour for Hot, Flat, and Crowded. I was on the LHF catering team plating up pre-show appetizers that we'd donated. I've read Friedman's columns in the Times, but haven't read his books. I definitely want to pick up a copy of HF&C now. Listening to him talk really began to redefine what I think of as "Green" and what we really need to be doing to help bring about revolution and change that is truly necessary for our the survival of our human race and its various cultures... and to redefine as well what we and the world think of as "American." Ria designed three appetizers to follow the theme of the lecture, each upon crostini made fresh that morning from Vosen's bagettes. As for the ingredients, we did what we could to ensure as small a carbon footprint as we could, using primarily locally produced ingredients (or as close to home as possible) from organic and sustainable farms. Also in attendance and working the crowd were Cristiano Creminelli and his partner as well as Tim from Beehive Cheese... although once it got a bit crowded for comfort in the reception room, they came back and hung out in the kitchen as we plated and we talked shop a bit and shot the breeze. The evening began slow, and we were worried at first as people didn't seem to be touching the sausage... but once it picked up, everything was a hit, and the food was heading out as fast as we were plating it up. After the event, we packed up and headed over to Setebello for a couple drinks and really killer Napoli style pizza prepared perfectly in their wood fired oven. I'd been meaning to go there pretty much since I moved here to Utah, so it was a real treat to end the night there. I had the namesake Setebello pizza topped with crushed tomatoes, pancetta, fennel sausage, roasted mushrooms, pine nuts, mozzarella, basil and extra virgin olive oil. It was hot and flat, but certainly not crowded despite the melange of ingredients. Just the right amount of everything bite after delectable bite. I'll definitely be heading back for more! All about Emi... well, almost.